It is very difficult to bring foreign debt capital into India which continues to limit the fundraising options for India-based businesses. It is particularly difficult for microfinance institutions (MFIs) because unlike Indian banks they are legally prohibited from collecting savings from consumers which can then be re-lent to borrowers. 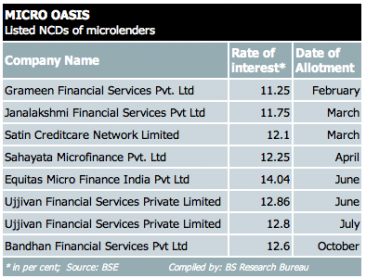 This means that to expand their lending to micro-entrepreneurs, MFIs must raise on-lending debt capital through borrowing from Indian financial sources (predominantly banks), securitize their existing micro-credit loan portfolios (essentially selling it off) or find other creative means of raising debt capital from foreign sources. And if you’ve been tracking the Indian bank lending to MFIs trend in India, you’ll know that these banks have dramatically pulled back over this past year. The Reserve Bank of India’s Foreign Exchange Management Act (FEMA) does not allow investments by foreign investors in primary debt issuances, but they can invest in listed securities (subject to government limits.) So, for every road-block, there is a work-around. Why not package debt as listed securities? Enter the non-convertible debenture product or NCD. Here’s how it works. An Indian MFI sells a new, rated security to a domestic investor who sells it onwards to a foreign investor once the security is listed. The domestic investor makes a reasonable profit on this financial structuring and the foreign investor gets to provide debt to an India MFI. While the Indian securities regulator, SEBI, has allowed foreign investors to invest directly in “to-be-listed” NCDs, FEMA regulations are yet to be modified accordingly by RBI. Such a change would considerably reduce the ease of issuing NCDs to foreign investors, creating a buoyant debt capital market for Indian companies. Unitus Capital has successfully completed five NCD transactions for India MFIs, raising over INR 125 crores (USD $25 million) and is currently working on numerous other NCDs. The catch? SEBI only periodically opens and closes windows (and amounts) of NCDs which can be floated. The process depends on overall debt availability at any given time, as capped by the RBI, and is impossible to predict and irregular. So, while this is a proven way to raise foreign debt capital, it is not something that can be counted on within a short time window.